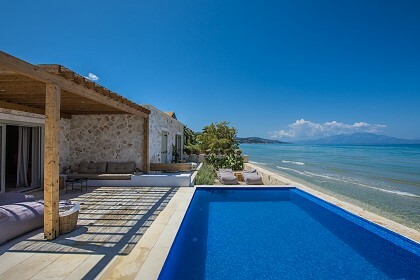 Treat yourself to the best sea and the best views in our beachfront villa. 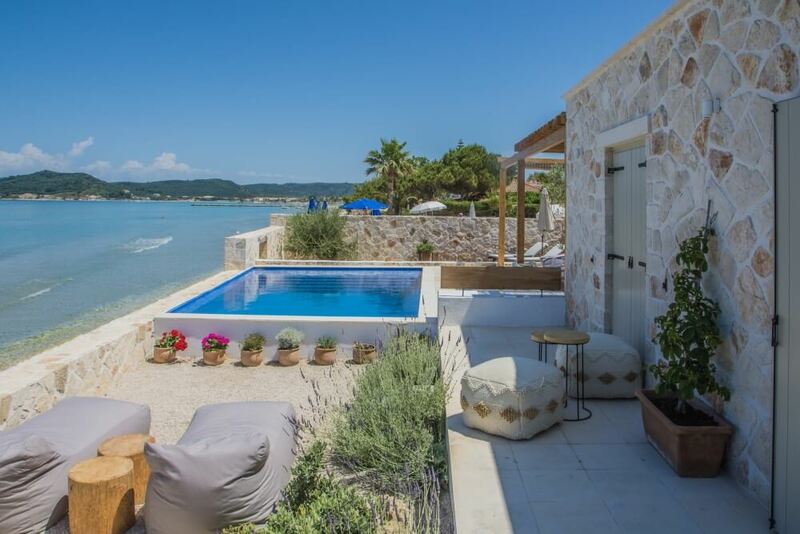 Situated right on the beach, Niova Villa in Alykes is the ideal destination for quiet and relaxing holidays. This inspired three-bedroom villa can accommodate up to 6+1 guests and features a truly unique and modern design. 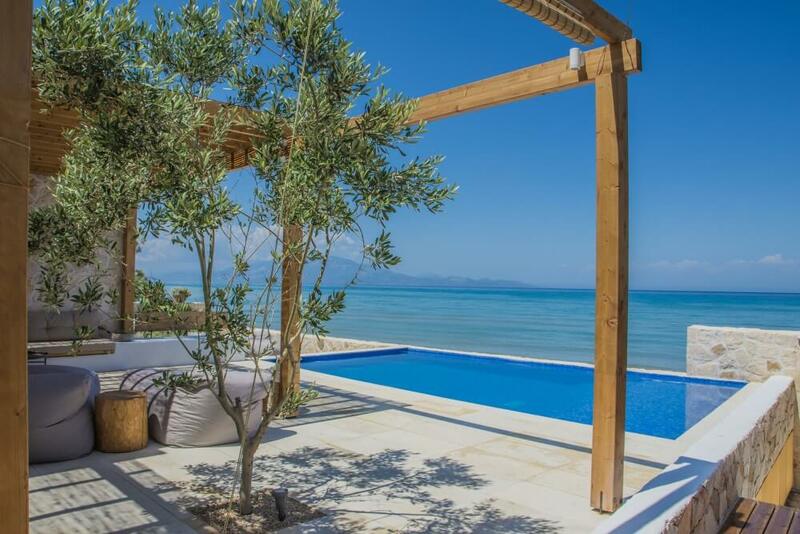 Enjoy the sparkling sea view and your stay in our brand new property. The high ceilings, skylight and large windows allow the living room to transmit an airy feeling. 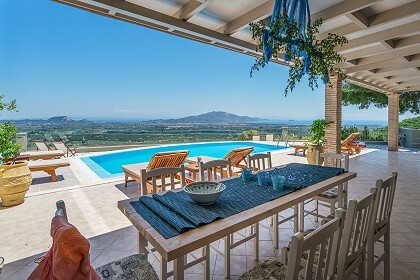 The bright, breeze interiors of Niova villa create a minimalistic backdrop for you to take in the fantastic sea views. Cook up in our modern, fully equipped kitchen while your beloved ones are relaxing in the spacious living room. 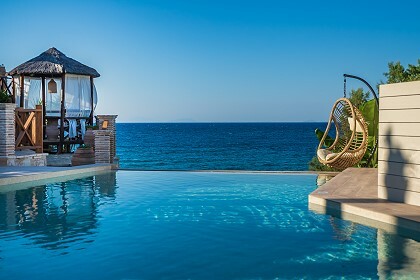 Sophisticated and full of taste, each room of this particular unique villa conveys to the guests a true feeling of relaxation. 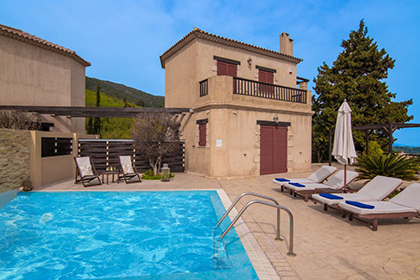 The property offers two bedrooms with double beds and en-suite bathrooms with shower, one bedroom with two single beds that can convert to a double. There’s also an additional shared bathroom with shower. As we are dedicated to provide a unique and unforgettable stay in our guests all of our beds provide the well-known Simmons high quality mattresses for an authentic feeling of deep relaxation. Among other facilities and services, the villa offers smart flat screen TV in the living room, daily cleaning, two bicycles for adults with a chair for an infant on one of them as well 2 Kano kayaks suitable for two adults and a child each so that you can get the most out of your stay. Just a few minutes driving distance from the North part of the island. 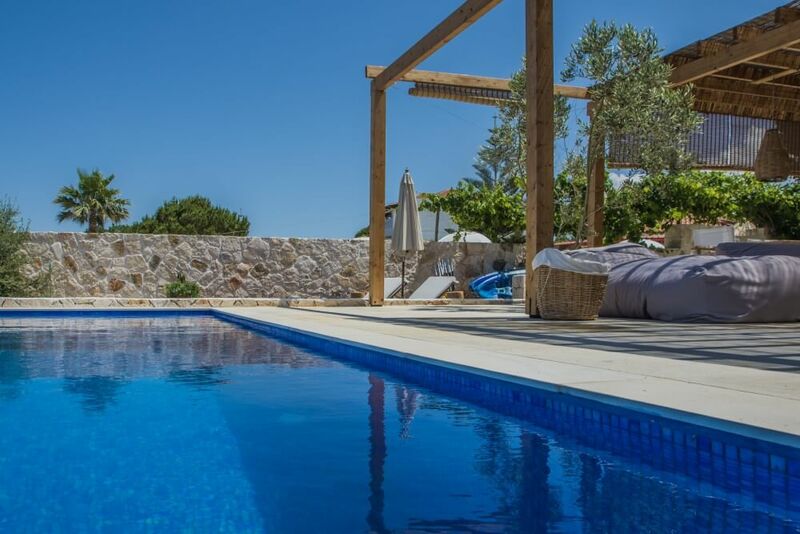 The villa's location puts the guests close to all the beautiful well know parts of Zakynthos Island.The guest can find many must-see places close to the villa, from the magnificent Navagio beach to the picturesque villages of the North. Not to be forgotten, Makris Yalos or Xigia Sulfur beach and many other unique places. The tourist resort of Alykes offers to the visitors restaurants, tourist shops, medical center, clubs, bars and of course a beautiful sandy beach with transparent clear waters. Zakynthos is the third largest of the Ionian Islands and for sure a place to fall in love with and ff you are seeking a destination to explore then Zakynthos Island offers you many places to discover.